It’s time to take a look at the next Cardfight season! The show has already solidified itself in the Top 5 shows of all time and these extra seasons just continue to cement it there. It’s going to be just about impossible for the series to step down at this rate and it has earned itself a spot as a true rival to the Yu-Gi-Oh series. Both franchises have titles that are above and below the others. The best Yu-Gi-Oh season is above the best Cardfight one, but they’re all pretty neck and neck as they fight for the top spots. This G season is the best installment and it’s definitely up there with the classic seasons now. With G already getting another season that’s currently airing, there’s just no slowing down for this title. If it can even manage to pass NEXT, then G really could pass some of the classic seasons. This season has a bit of a timeskip. I forgot the details on how long it was, but the three main characters have split up. Chrono has grown bored of dueling to an extent. It’s probably because he is so much better than his current competition, but it’s also because he just doesn’t know why he’s dueling. He’s lost his purpose. This all changes when a mysterious guy walks into the shop and challenges Chrono. Chrono is soundly defeated and the man then tells him to enter the Under 20 competition. Chrono vows to enter to try and take his revenge on this guy, but he’ll need to find 2 new partners. He chooses Taiyou and Kazuma. These three will have to quickly develop into a team if they want to win because there’s some tough competition ahead. Shion is still trying to balance being a company head and a Vanguard fighter. The latter has been losing out lately. Then he comes across a Cardfight club at his school which is going to be demolished by the school board. He pulls some connections and convinces them not to shut it down until after the Under 20 tournament. If they win then the club gets to stay open. The board agrees and Shion quickly recruits the scrawny club president. They’ll still need a third member so Shion recruits a reluctant Rin into the fray. This team has even less camaraderie than Chrono’s so they’ll have to bond fast. Finally, Tokoha moved to France to get away from Japan and dueling. There she meets a guy named Miguel and the two hit it off right away. Unfortunately, he is run over by a car and dies instantly. He had been going to enter the Under 20 so Tokoha decides to fulfill his dream for him. She heads back to Japan and decides to team up with her best friend Kumi and the ex sub-leader of the villains from the last arc. He’s a changed man now and decides to help her out in order to pay back his crimes from last time. As they all enter the tournament, they are unaware of the true threat lurking in the background. The Diffriders are using this tournament to end Cardfight once and for all. A Diffride is when a monster possesses a human. So, three powerful monsters inhabit 3 powerful players including the legendary champion Kazumi Onimaru. They believe that Cardfight forces monsters to be shackled to destiny so eliminating the game is their way out. 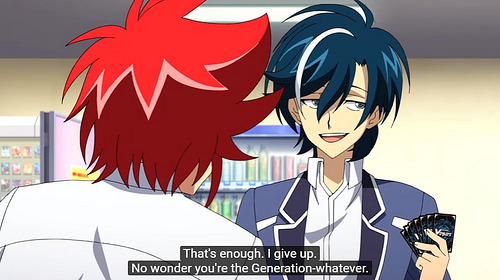 Kouji calls in some old characters like Aichi and Kai to help out, but at the end of the day the new generation is going to have to handle this. Can Chrono, Shion, and Tokoha take these guys down or is it already too late? It feels good to have a Cardfight season with 50+ episodes again. That’s always a good sign since it gives the show a lot of time for all of the duels. Considering how many big characters there are here it’s certainly for the best. After all you want to see all 3 of the main characters take on Kazumi. 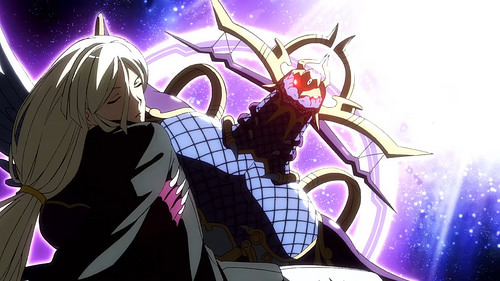 I was worried at first since Shion’s first fight with him was off screen but they had a proper fight after that. This season tries to bill Chrono, Shion, and Tokoha as three equal main characters and they do a pretty good job with it. All of them get pretty large roles in this season, but at the end of the day we all know that Chrono will have to be the one to step up. He’s still a bigger obstacle for the villains than the others because of his unique time deck. The animation style is very different from the last seasons and takes a little getting used too. Although, it may be more the character designs than the animation that feels rather different. Shion’s in particular doesn’t work too well I have to admit as he just looks extremely overconfident and like the kind of character that you can’t take seriously. It’s not really the personality that’s the issue, but the design just makes it a bad mix. Tokoha’s also doesn’t mix well with her new voice since she sounds really old instead of being the same age as the others. I think her VA gradually gets better as the show goes on. The animation brings its A game when the duels begin and they always look flashy as you would want them to be. The action scenes can be high budget when they happen although the first half prefers to skip most of the actual duel in favor of the talking. I do miss seeing the battles in more depth from the original series but I’ve grown used to the fact that the show has moved on from that. It’s still showing a lot more than it used too. I would certainly give the animation a passing grade here. It may not be quite as catchy as some of the other seasons, but it’s still consistent as always. You can still take one look at the anime and deduce that it is a very modern title. I appreciate what they did for the soundtrack in this season. Each major character has his/her own theme as opposed to a standard battle theme being applied for everyone. I’ve always been a fan of characters getting their own theme since it makes the duels more personal. There can still be standard themes for when there isn’t a big moment or something and that happens as well. The soundtrack here is easily 5 star material. Unfortunately, Chrono’s theme may be the weakest from the main characters which is ironic, but it happens. The villains tend to have the best themes here, but Tokoha likely has the best hero theme. It’s a nice balance of intensity/emotion to fit her character arc. I think it goes without saying why this season is one of the best. It’s essentially all just a huge tournament. Right up until the last episode which is the aftermath, the 51 episodes before that are all from the tournament arc. Of course, it doesn’t start immediately though. First the show builds up to it by showing the 3 main characters assemble their teams. Each team gets a few episodes and then they have to deal with their personal issues. There are quite a lot of those and they pop up between tournament rounds. Don’t be mistaken though, the tournament is still quite long and just about every duel is given a full episode. That results in a lot of duels and it was one of the best handled tournaments in the series. It’s a battle royale style like Battle City where you just fight whoever you bump into. The logistics and rules of it could be a little intriguing at times, but it’s handled well and it’s always fun since you never know who you’ll bump into. Plus, you can keep going even if your teammates lose which is a nice touch since I never liked being defeated by default. It was a wise move from the show since it doesn’t have as many rivals as the original Cardfight. You can’t really compare the two when it comes to threats to the hero team. The only team that could fight well against any of the 3 main characters would be Onimaru’s team or maybe the 3 kids, but everyone else consists of no names. In the old Cardfight we had Ren’s team, Shion’s, the Celebrities, and a few other high tier teams. There are many other characters that G could have pulled out, but since the rules specify that you have to be under 20, most of them couldn’t enter by default. I still think we should have had an Aichi team since he shouldn’t be 20 yet, but maybe he is. It’s certainly possible since even Kamui was getting close to the age limit but still made it in the tourney at least. As a result, the Battle Royale method is good because then the main characters can take on Onimaru’s team without actually getting eliminated yet. It was certainly really hype how he took out all 3 main characters on his own. That’s pretty unheard of and it’s why he’s one of the best villains of the series. This whole season is also build up for the upcoming Z installment since the real villains are about to make up their move. It’s similar to the last two G seasons where the first was set up for the climax arc. In that case the season was essentially split into two half seasons so this one had even more build up since it was 52 here to lead into what could be another 50+ installment. Unlike the other set up season though, this one was still really exciting and had a lot of epic duels throughout. The stakes were still pretty high as well and that’s because the overall level of dueling has been kept pretty high. Having to deal with actual monsters and former champs makes the road rather tough for the heroes. I do feel like the older ones are being left in the dust like Ibuki and the rest of the Dragon Branch managers, but it had to happen sometime. I definitely have really high hopes for Z as a result but passing this one will be tough. Chrono is a solid main character as always. He’s certainly more experienced than he used to be and is treated like a pro. His jacket/jersey is pretty cool and he’s just very calm and collected. He’s not as hot headed as he used to be, but will certainly act quickly to protect someone when necessary. His challenge to Onimaru after Kazuma was taken down was definitely one of his best moments. Even if it wasn’t an authorized tournament duel, Chrono wasn’t going to let him get away without a fight. I’d actually say that he is considerably better than Aichi back when Aichi was a main character. 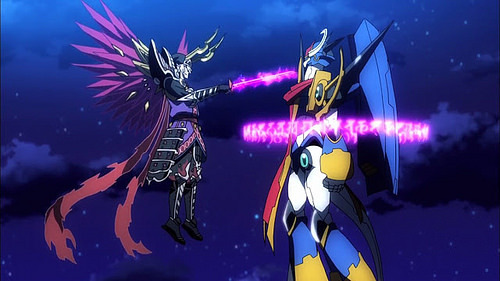 Evil Aichi is still the best, but comparing their heroic selves, you want someone like Chrono on your side. Taiyou is Chrono’s right hand man on the team. He’s still improving a lot and is the most enthusiastic of the team. I like him well enough and consider the kid to be underratted. He’s certainly not one of the strongest yet, but he’s getting there. His personality isn’t as interesting as some of the other characters but he always gives it his 100%. Definitely someone you can root for. Kazuma is the new kid in the group and he starts off as being very unreliable. He’ll quit games in the middle and tends to run off when things get tough. He gets better, but it does take him a while. I always thought he had potential because his design is pretty good, but of course that’s not the best reason to root for a character. His ritual deck is very unique for Cardfight and he’ll definitely go pretty far as long as he keeps appearing. In some ways he’s a lot like Naoki although certainly not in personality. Either way I liked him well enough by the end. He’s not quite top tier yet power-wise, but like Taiyou he is improving very quickly. He’s likely surpassed Taiyou by this point as well. Next is the rival team. Shion isn’t quite as good as in the last few seasons, but it would be tough to pass that. Gone are the days of breaking into villain hideouts and beating the information out of the minions there. Still, he does a good job of saving the card club and does his best in the fights during the tournament. 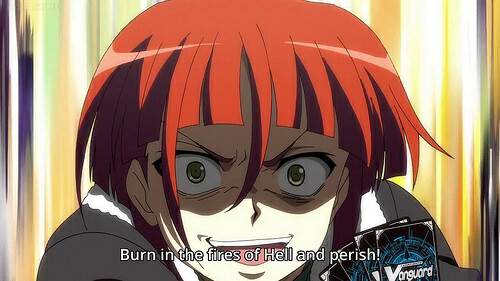 He’s still one of the strongest cardfighters although he is no longer a match for Chrono. His Paladins are always fun since they remind you of Aichi’s deck. His design works against him, but Shion is still a good rival as always. Unfortunately, he has the worst teammate in Henri. Heri’s always very nervous and he isn’t a particularly good cardfighter. He holds the team back and none of his scenes are funny, they’re just annoying. He never really improves as the series goes on so he’s the only new character that is actually bad. He’s not a terrible character who would hurt the show or anything, but he simply doesn’t contribute anything. It’s fun to see Rin return since she had a pretty big role in the older episodes. She’s done a pretty good job of keeping up with the newer characters, but I’m not sure about her going pro. I just don’t think she’s quite That good to keep on fighting at that level. Still, I suppose she’ll keep improving as long as she stays with the main characters. She’s a better character than she used to be. Tokoha gets the biggest character arc from the main leads. It starts out pretty badly for her since she’s in mourning and it heavily affects her dueling. I was wondering why she kept losing at first, but I suppose it was all build up for her to finally get over it. She’s still a strong duelist, but taking a break for a few months certainly did hurt her in comparison to the others. Of course, everyone had breaks for not dueling as much lately so she didn’t fall as far behind as she could have. It’s nice to have her back in Japan and hopefully she is here to stay this time. Tokoha’s definitely a nice character to have around and is a good main heroine. A shame she couldn’t get better teammates though. Her best friend Kumi is around to help, but she can’t really help. There’s no realistic way she can contribute to the team although she helps get Satoru into his rage modes when he has to avenge her. Onimaru in particular did a number on her in the duel as he defeated her so completely that Satoru had to step in. Naturally he was no match as well but at least he put up a good fight. I still don’t like Satoru since there’s no way to get around how evil he was last time. The whole season is about atonement though so at least he’s working to get past it. I dunno, I should give him a second chance, but it’s still hard to root for him in any of the duels. So as a compromise I still root against him all the time, but at least I tolerate him on the team. Maybe one day he’ll be a more likable character but in this season he technically doesn’t do anything wrong. Kazumi is the big main villain of the season and certainly excels in the role. He might be the second best villain in the franchise behind Ren. The cliffhanger in episode 15 helped cement this as he took out Shion and Tokoha with ease. It’s one of the best cliffhangers in all of Cardfight G for that matter and it really set the tone for his character. He’s always very confident and his skills can back that up as he took so many fighters down. Clearing the first stage of the tournament in a single day was completely unheard of, but he still managed to do it. The character is really handled perfectly so I’m definitely going to miss having him around. He’s a major part of why the season was so good and he’s likely in my top 10 characters for the series. I can’t stress enough just how hype he was. To counter that hype, Verno absorbed a lot of the losses in the series. I felt bad for her since she’s one of the big hype characters, but tends to lose a lot so other characters can get some hype. She’s not evil like the other two so that’s likely the reason as she has fun with her fights and doesn’t take them as seriously. She’s not a bad character, but it was a little hard to take her seriously as a result. It’s all well and good to have fun, but this tournament probably wasn’t the best place for it. It would have been nice if she could have gotten more big fights before leaving. Finally, there’s Saori who has the best musical theme in the entire show. It’s a nice rock song that fits in very well with his very aggressive fire deck. He’ll also be appearing quite a bit in the next season so that’s certainly going to be exciting. I definitely liked him a lot and he was the 2nd best villain in the show. He’s good at messing with the opponents by throwing insults around and he’s certainly a formidable foe. Only Chrono could do well against him at first and then he had a big fight with Kazuma at the end. Hopefully he keeps his confident edge though as he seemed rather nervous at the end of the series. The loss may have broken him and if not, the hype of the new villains may do him in first. Either way his theme should definitely return. There are naturally other characters around, but only a few more need to be mentioned. Team New Nippon shows up and they admire Chrono’s Dad and his old team. They’re nice kids who want to be good duelists in the future. Surprisingly they will actually be getting a role soon as one of their members, Noa has been possessed and looks to be a big antagonist in the next season. He is with the Link Joker deck and I’m sure everyone remembers how tough those guys were. I can’t speak to his character much yet since he hasn’t really started to appear much yet, but I’m expecting big things. He has a lot of potential. Some of the old guard like Mamoru are still around, but they aren’t very helpful anymore. I’ve never been a Mamoru fan and it’s not like this season helped with that. He talks a lot, but rarely takes an active role in stopping the villains. The same can be said for Kouji as well by this point. He still doubts Chrono’s ability even after getting consistently wrecked by the kid. Any mystery and intrigue his character may have had is long gone by now. He needs a big scene to bring back the hype, but it may be too late by this point. I feel like the heroes just don’t need him all that much. Kamui doesn’t get any big duels compared to the last season, but his character arcs have all already ended by this point so it makes sense. At this point it’s just nice to see him as a cameo for the fans. He does duel as well, but vanishes whenever the going gets tough. One annoying thing about the season is that they always hype up Aichi and the other old characters, but they still don’t do anything. I want a big Cardfight G climax with the old characters being around to help out. Aichi does duel Chrono in a practice duel but then vanishes after that. One episode preview hinted that he would fight, but it was clickbait. Since the villains are looking for more hosts, I’m hoping they possess Chrono and then Aichi becomes the main character for a few episodes. It’d be a hype twist and I just want to see how much stronger he is. The old characters are appearing more and more now so I can only assume that the show is building up to something with them. That’s my hope at any rate. As I mentioned earlier, the show does seem to be going for a more Shonen angle. It feels more like Yu-Gi-Oh Duelist then the classic G episodes for example. The villains are aiming for end of the world type situations now and there’s less time for fun and games. There are episodes dedicated to reminding the heroes not to lose sight of why they play and all, but they can’t mess around either. Even the final episode ends with a very classic villains meeting moment. That’s always fun whether it be the Akatsuki in Naruto or the Espada in Bleach. The new villains definitely have a lot of potential and I want to see them bring the fight to Chrono right away. One of my favorite tropes is when a new villain suddenly shows up to take on the main character in a new arc once the main character has just beaten the old main villain and is seemingly untouchable. Win or lose, it sets a high bar for the rest of the season and then the main goal is simply to keep the pacing up. Yu-Gi-Oh Zexla II had a fantastic season opener in that regard as it followed the trope perfectly, but then the plot vanished for a while. That’s the downside, you don’t want to go back to slice of life after a very intense season opener, but I’m confident Cardfight won’t fall into that trap if previous seasons are anything to go by. Overall, This is another great season, but I expected no less. I went into this one with high hopes and was not disappointed. While I was cautiously wary about the new animation style at first, I got used to it really quickly. The taller, more shonen character designs work well to make the series feel more battle ready. It’s an effect that I am always enthusiastic about. The character designs may not have been optimal, but they’re not bad. The soundtrack has certainly improved and as we’ve been with these characters for so long it’s easy to get invested with what is going on now. 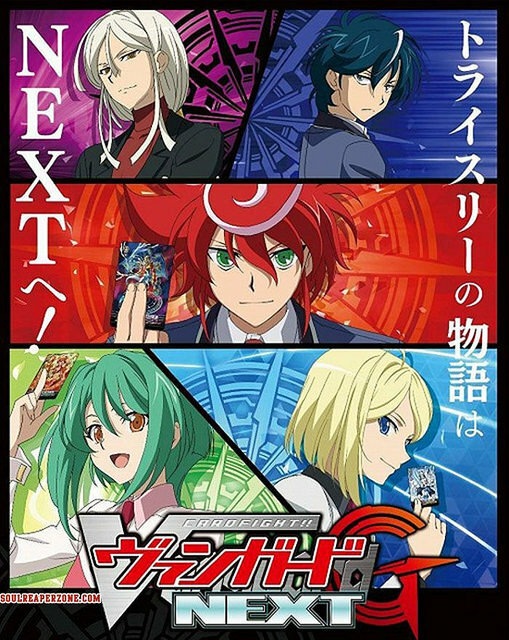 If you haven’t seen any Cardfight shows yet you can still jump into this one pretty easily since it’s a new status quo and isn’t too reliant on the older seasons. Of course you’ll appreciate it more if you’ve seen the other shows though. Either way, it’s a great all around show with no real weaknesses and definitely one of the best. This entry was posted in 9 Star TV Shows, Reviews, TV Show Reviews, TV Shows and tagged Anime, Anime Review, Card Game, Cardfight Vanguard, Cardfight Vanguard G, Review, Sequel, TV Show, TV Show Review by dreager1. Bookmark the permalink.